Mobile Forest Adventure – travelling anywhere in Japan! 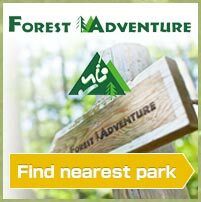 Forest Adventure is a forest activity, but the mobile course can come to events held in towns. The mobile course uses the same harnesses as normal Forest Adventure does, which is exciting for kids. To do the mobile course you must be 110cm tall. Why not bring the mobile course to your event? 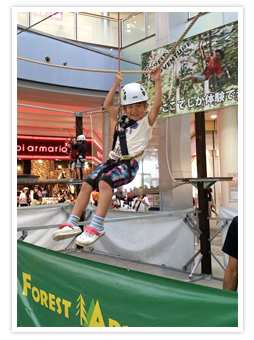 The mobile course has been an attraction at many events and shopping malls around Japan – yours could be the next! For further details, please see the mobile course pamphlet (click here to download).